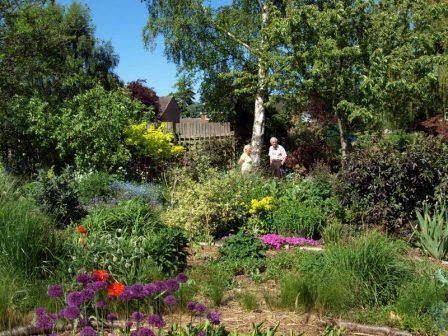 During the Open Gardens weekend, thirteen varied gardens, including 4 National Garden Scheme gardens and the recent Repton Memorial Arboretum will be open, most on both days. Year after year, visitors come from far and wide to this event and we are always delighted to welcome them, exchange ideas and make this a special weekend. Teas will be served in the village hall from 2.30pm to 5.30pm on both afternoons. The United Reformed Church will serve cream teas in the School Room from 3.00pm to 5.00pm on Saturday only. Scarecrows will be on display around the village and there will be prizes for the most entertaining or inventive scarecrows. A Children's Garden Trail will feature in most gardens and a small prize will be given in the Village Hall for each completed entry. The event will open with bell ringing from St. Wystan's Church. There will also be a Children's Church Trail which children are encouraged to try with the help of their families. There will be a number of stalls in gardens and at the village hall including a tombola, a plant stall, a bookstall and home produce stalls. Proceeds in aid of St Wystan’s Church funds. Several of the gardens will have plants sales. There is also a home produce stall. On sale at the village post office and butchers beforehand and at the Church lych gate, village hall and in the gardens on the actual open days. This event involves a Scarecrow Trail. 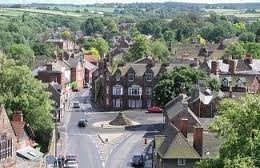 Repton is located near the A38/A50 intersection - follow signs to Willington then Repton. A plant lover’s garden, on a sloping 2.5 acre site, developed organically for all seasons. On the lower levels, maturing perennial and shrub borders are connected via lawns, thyme bed, pond and pergolas to a small specialist nursery offering easy and unusual perennials. Moving up and away from the house, walk the grassed labyrinth and meander through the woodland walk, that we share with James our Aylesbury duck and an ever growing range of wildlife, to our spacious fruit, vegetable and herb potager. For those who prefer peace and quiet, our two fields on the highest level of the garden provide a welcome retreat at the end of the day’s work as they merge naturally with the countryside beyond. Looking back towards the house is a wonderful view of the snake-like hedge that follows the contour of the hills. A large garden packed with colourful and unusual plants. As you meander through the garden you will see borders packed with common, unusual and interesting plants; there is an emphasis on vibrant colours, bold structures, interesting foliage and heady scents. Near the house is an ornamental pond and waterfall, which is more formal than the wildlife pond at the far end of the garden- watch out for frogs watching you! The new ½ acre “field” is being developed into a woodland, butterfly beds, vegetables and yet more compost heaps. We have planted scores of trees. Remember that it was a field of wheat just 6 years ago, it is amazing how quickly the hedge and trees have grown up. 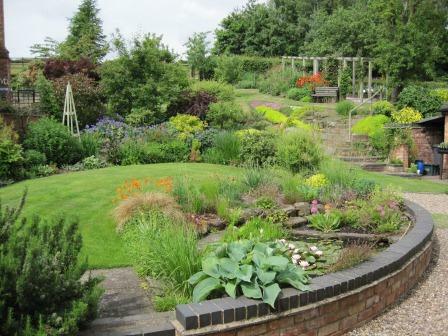 The present owners of this garden of over an acre have spent the last 27years developing a garden for all seasons and they are continuing to make changes. 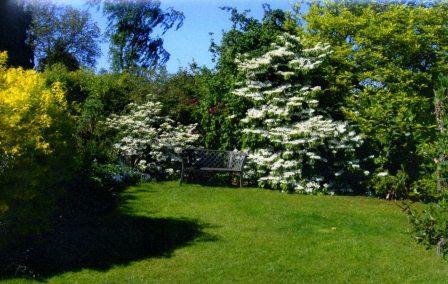 It is divided by Repton Brook which loops around to enclose the lower, larger part of the garden. 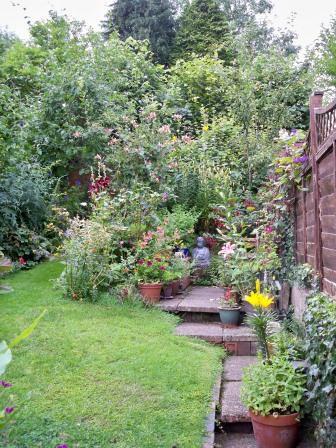 The area near to the house is more formal, including fish ponds, lawn, herbaceous borders and vegetables. There are always plenty of containers providing both spring and summer colour. Over the bridge, you can enjoy woodland and brook-side walks with rhododendrons, azaleas, camellias and specimen trees with a ferns area and grasses leading to a lawn with rose beds and a wildlife pond. Trees planted over the last 25 years include a Sequoiadendron giganteum which is rapidly living up to its name, a large Tulip tree and a Ginko biloba. There are plantings of bamboo and moisture-loving plants and plenty of seats to sit and relax. A small garden on a steep slope overflowing with interesting plants. You will receive an enthusiastic welcome and wonder how she fits so many plants into such a small space, the exuberant character of the garden reflects energy of the owner. Places to sit and enjoy the atmosphere; she breaks all the rules but it works!